Gillette Children’s Specialty Healthcare is a world-renowned, non-profit hospital in Minnesota’s Twin Cities. The integrated campaign, which uses local broadcast, web, and out-of-home advertising to feature stories like Noah’s, inspires a new way of thinking—going from great to greater; from achievement to lasting achievement—as an alternative to our habitual response, which is to go from what we think of as “bad” to slightly better. From disabled to merely able. As a message, Cure Pity is powerful enough to help people start looking at their fellow humans a little differently. The campaign is as smart and strategic as it is inspired. Campaigns that cultivate pity induce a feeling of hopelessness that your one, meager contribution can make any difference. Perhaps you make one donation, one time, to shake off the uncomfortable feeling. Instead of pity, a more positive message invites compassion, which is an invitation to a deeper experience of shared humanity. Cure Pity asserts a call to action based on admiration instead of despair. It also subtly positions Gillette Children’s over an unnamed alternative: other hospitals that focus less on fostering quality of life and more on symptoms. From a visual perspective, the campaign has one unrealized opportunity. It could do much more to pair up the copy with better design. Without both you wonder if an organization is fully committed to its message. The strength of Cure Pity is storytelling. As a creative achievement, it asserts a social message that also helps a mission-driven organization continue to do great work. Advertising becomes culturally relevant when it can do either one of those things; curing pity does both. The government says you’re a bad dad. This ad is from a campaign sponsored by the Dept. of Health and Human Services. Couple of interesting assumptions in there. One, that African American men aren’t good fathers. Two, that anybody — especially a government agency — has the right to judge someone else’s parenting. Helping families succeed and looking after kids are noble intentions. This tactic smacks of the Moynihan era. Wendy’s – Now serving Canned Tweets. “We never freeze em like a hockey puck, or / keep em stuck / like some others may / in a warming tray.” It’s probably safe to take these claims at face value, given the popular understanding that advertisers are not allowed to lie outright. Wendy’s philosophy, the song says, is good old honesty. True or not, the claims are Wendy’s way of setting up the field in its favor, creating its own definition of “real” that it can’t fail to fulfill: real means serving food that’s been recently cooked, using “fresh,” and not frozen, beef. I doubt we take time much time to question what fresh means, either. Including “you” is one of the most inspired strategies in Wendy’s campaign. The desire to find things out for ourselves instead of from authority is a distinctly American quality; intentionally or not, the close-up of a timeworn “Declaration of Real,” the actor dressed as a craggy Abe Lincoln, and the fake Statue of Liberty featured in the spot are echoes of this fierce independence. Social networking has given this quality a shot of steroids. People have banded together against crappy products and their promises. Smart advertising has become more like a petition and less like propaganda in response. By putting You in the picture, Wendy’s syncs itself up with this cultural shift. It also frees itself from the burden of proof, introducing a completely subjective definition for what’s real. How to bring up the next point without trotting out the overwrought but ever true McLuhanism… it’s impossible. 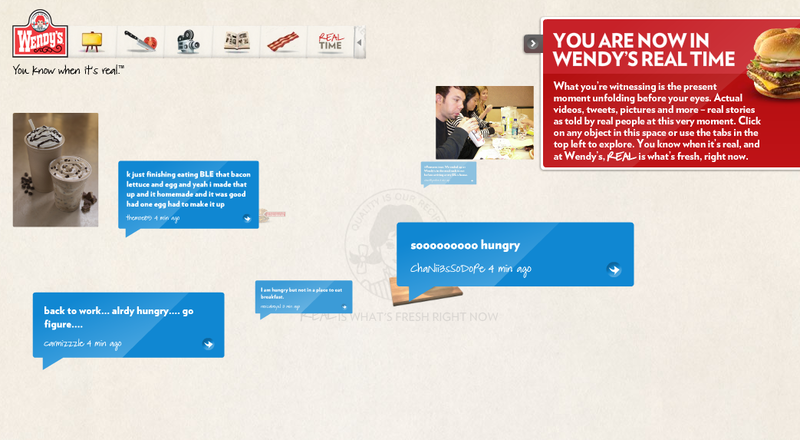 The medium is the message, and in the online arm of this integrated campaign, a Wendy’s Real Time microsite features what appear to be live Tweets popping up in little dialogue boxes. It’s a long time coming; somebody has invented a bot that mines Tweets for certain keywords and re-Tweets them. “Hungry” appears to be one of those words. Not necessarily hungry for Wendy’s, although the restaurant is occasionally mentioned. Perhaps there are canned Tweets mixed in among the authentic ones. Wendy’s retweets – real or canned? Some of the Tweets have nothing to do with food or Wendy’s at all. They just reflect online chatter, a discussion Wendy’s wants you to believe it’s a part of. But are these actually authentic Twitter accounts? You’re skeptical at first. The Tweets really do look engineered (some of them must be; stay long enough on the sight and you will see some repeats). But if you click on any one of them, you do end up on someone’s Twitter profile. I tried it. There was @baby_ge0rge, whose latest update said, “#whatsbetter Booty or Breasts?? ?” It depends I guess. Are they real? Reflux Everything – The new Pepsi anthem. Some time last year, Pepsi introduced its new branding on broadcast TV. The “Anthem” spot edits together Dylan’s original Forever Young and a remix version by will.i.am. It jumps between clips of both artists, with Bob in black and white wearing classic Ray Bans, and also between scraps of historic and contemporary footage. The first airing probably kicked off a big spike in Google searches and downloads of Forever Young. And in bids for vintage frames on eBay. Not so much in Pepsi sales or refreshed perceptions of the brand, one would expect. Pepsi didn’t dig too far for a concept — people still do things they did in the sixties. There was music then; there’s music now. We had a gruesome and unpopular war back then; we have one now. In the sixties we had skateboards and watched Gumby. Today we have skateboards and watch Shrek. Good TV commercials create a good feeling and then give you something to do about it. It’s hard to find any of that here. “Refresh Everything” is the new Pepsi Anthem. Is refreshment what people want from Pepsi? Pepsi is refreshing when you’ve eaten a lot of salt. It will also take the edge off a serious migraine. Targeted at the millenial generation, “refresh” is internet terminology, for the kids, with their texting and such. So it follows that Refresheverything.com mimics the experience of a social utility. Like a social utility, what appears to be user-posted content takes the lead over design and copy, which don’t come off authentically, but instead, as afterthoughts. It’s alleged that millenials are more socially conscious, and the site strategy reaches for that too. A vague social message is layered somewhat awkwardly on top of what is still, at best, a soft drink brand, not a make-a-difference brand. Pepsi could start making a difference by paying the dentist bills of a million Americans. This ad is just about sparkles that move in an infectious way to create a feeling, that grows, and at the end you think you might as well drink a Diet Coke, because it’s kind of sparkly too. Rumors say Diet Coke is a nerve toxin. But it does quench your thirst, and you don’t feel guilty drinking it, because you’d rather be forgetful, slur your speech, or shout curses at people, than get fat. The Pepsi ad doesn’t do either thing, create a good feeling or make you thirsty. But it does make me want to look around on eBay for a pair of vintage Ray Bans. Maybe Pepsi should sell them. Apparently everything else is for sale, including Bob Dylan. Rushing along Southbound 35W in Minneapolis you get a quick look at one of the new Pepsi billboards. It’s amazing where your mind can go in a single second. The new brandmark looks a lot like a tailfin logo for a small airline serving former Soviet republics. The once-iconic red and blue encroach on a squashed version of the classic Pepsi swoosh. In these ads, the logo is sitting on a flat blue background with the one-word headline Fabulous. If you’re a person who notices typefaces this one won’t feel very inspired, and not to get too particular, but there’s something about the width of the characters and the way they are spaced that seems a little off. You wish you could tell somebody to squoosh them together, just a little. So what’s fabulous? A trip to where? Maybe the bottom of the ocean, minus cash and passport. This series of ads are part of Pepsi’s global re-branding (you may also have seen the TV spot in early ’09) which is focused on millenials. It’s part of an effort to respond, as many brands are doing, to the social aesthetic of social media. You see a better example of the strategy when you visit the Refresh Everything site. It looks kind of like a generic and impersonal MySpace page, without the personal photos or found images and patterns people use as wallpaper on social utilities. When the social media aesthetic is pulled off effectively, it evokes an immediate sense that behind what you’re seeing and reading is a poster, vs. a propagandist. It personalizes brands. Pixelated doesn’t look unsophisticated anymore, because authenticity has supplanted slickness, and authentic content looks like a post, from a guy or girl out there on the internet, whose posts you read. Pepsi’s site looks just “designed” enough to appear inauthentic, but not enough to deliver the fashion, awe and electricity you’re looking for in a big brand. You’ve got to go one way or the other. Maybe someday, manufacturers and their agencies will figure out how the ads we see can actually be assembled and posted by our friends, and not just look that way. That would be the essence of social marketing. Until they can do that, brands, at least soda brands, should go for the look of a blockbuster and not a home video. I like to see what my friends are doing, but if you know my friends, you probably wouldn’t want them bottling your soft drinks.